A dog that is itching and scratching is miserable. If you own a dog that is always itchy and scratching, you're probably wondering what could cause such misery. The reality is pruritus, or itchiness, may be one of several things. Only when you understand what causes the itchiness can you find a remedy. Itching and scratching are signs that something isn't right. Severe itching can cause scratching that can do more damage to the skin, stimulating inflammatory reactions. Your dog's skin may become inflamed or even infected. The two major causes of itching are allergies and external parasite infestations; however, other conditions can cause itching, including cancer such as lymphoma, fungal infections such as ringworm, seborrhea, skin fold pyoderma, autoimmune diseases such as pemphigus, internal parasites and infections. Dogs with pruritus may scratch, chew, bite or lick at an area. 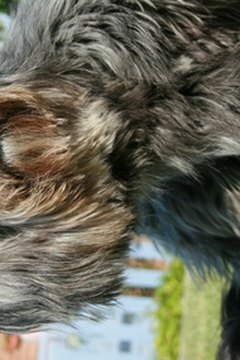 If you see an area of fur that is unnaturally reddened, your dog may be biting or licking at that spot. You naturally want a quick remedy to help your dog; however, some problems may require several weeks or even months to correct. Medication to stop itching will help with temporary relief, but seldom corrects the underlying cause of the problem and, therefore, only masks the symptoms. Food allergies, for example, require the dog to be on a hypoallergenic diet, free for several weeks from whatever was causing the allergy before you're likely to see an improvement. You can prevent itchiness by using flea and tick preventives to keep external parasites from infesting your dog. Keep your dog's hair mat free by brushing and combing him at least weekly, if not daily. Feed your dog good-quality dog food free from fillers and artificial colors. If your dog is itchy, have your veterinarian examine him before the problem gets worse. Your veterinarian will prescribe the proper medications or diet to treat your dog's skin problems.